The backcountry ski touring leash from B&D is designed to alleviate the need to detach and attach your skis while putting on your climbing skins. 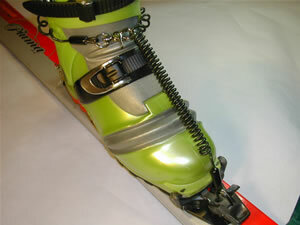 The 1980s phone-style elastic cord stretches enough so you can lift your skis to put on your skins. This means you won’t lose your ski during transitions. It also allows for more slack in the line when your bindings release in a fall. Last but certainly not least, the leashes come with a breakaway feature to help prevent your skis from pulling you under in an avalanche. 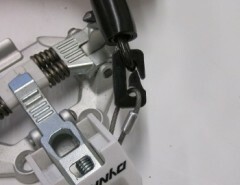 With enough force, a link in the chain brakes so you can swim to safety (hopefully, *gulp*). Coiled cord dissipates energy in a fall, reducing peak force on the leash. 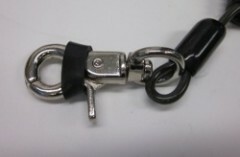 Two fuse links included that will break at either 40lb or 60lb of force. 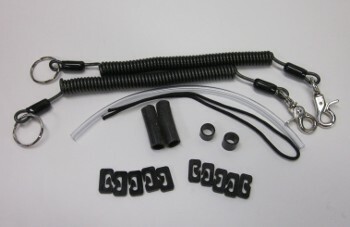 Also comes with Vinyl tubing to protect the cord in wear areas. Cords extend to 6 feet, which may keep your sharp edges away. 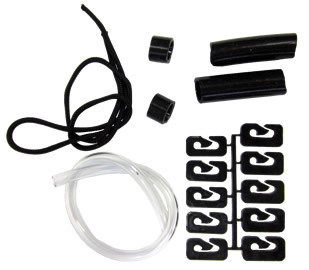 Snap-hook is easy to operate with gloves for quick operation. Cord can be wrapped around your boot to stay out of the way. For starters, I am not a fan of ski brakes. I prefer a leash - it makes me more confident that my ski is going to stay a ski and not turn into a scavenger hunt. After a day on the stock Dynafit leashes that came with my Speed Radicals, I decided that I wanted a bit more length and versatility with the leash. Fortunately, I'd seen these leashes while looking on B&D's website for some toe riser plates for the same bindings (before SkiMo.co carried B&D, otherwise I would have ordered from you guys...). The pros of the B&D leashes are that they have a break link that will separate you and your skis in the event of an avalanche, and that they have plenty of length to keep you out of harm's way if you yard on the descent. The long and short of these leashes (not sure whether the pun was intended or not) is that they work, and they are a nice upgrade from the Dynafit leashes in my opinion. The only down side of the leashes is that they are long, so if you prefer to clip to the front of your boot, you'll end up with a lot of extra leash flopping around, and if you leash around your cuff, I keep getting them stuck in my walk/ski lever. Neither situation is awful, and if I just stopped and thought for a second as I was attaching the leashes when I'm in walk mode at the bottom of the mountain, then the second issue would be solved.